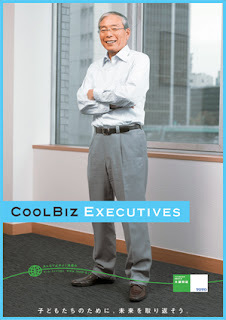 Cool Biz, Japan’s effort to rid the world of suits, ties, and carbon dioxide pollution, has made news since it launched in 2005. Seems Japan’s environmental minister Yuriko Koike had the bright idea to convince businessmen to stop wearing suits — in a culture that is very buttoned up — so offices could ease up on air conditioning. This in turn slashed electrical use and stopped 1.4 million tons of CO2 emissions annually. We ran through the news archives to try to see when, exactly, this ideavirus tipped the point. It helped that a core group, central government, was mandated to adjust office temperatures to 82.4F through September. Prime minister Junichiro Koizumi showed up for work without a tie. And in a brilliant move, the executive chiefs of Toyota, Fuji Xerox, Show Shell Oil and Sanyo were invited to model fashion sans ties in a gala held by Japan’s top designer Hiroko Koshino. All of which makes us wonder: How can anyone control such crowd psychology? Marketers try and try to push their products into mass adoption, but Razor Scooters, Hush Puppies, and tapping fists instead of high-fiving are all viral events in the U.S. that seemed to happen overnight, with little push or control. Perhaps viral PR can only be achieved if the cause resonates with the pop culture of the moment. Regardless of our politics, we think all of us may feel a bit bad about driving SUVs while it’s 91 degrees in October. So Japan, by accident or design, followed the rules of Seth in launching an ideavirus: make your concept virusworthy — will people really care? — and then identify the “hive” or core group to participate, expose the idea to key influencers, and give them the tools to spread the word.